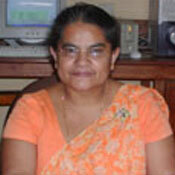 Professor Ayanthi N. Navaratne, currently Head of the Department of Chemistry, University of Peradeniya obtained her B.Sc. in Chemistry (Honours) in1984 and MS in Chemistry (Inorganic Chemistry), Ph.D in Chemistry (Analytical Chemistry) from University of Hawaii at Manoa (UHM), USA in 1989 and 1992 respectively. As a graduate teaching assistant at the UHM, she received Excellence in Teaching Award from the Hawaii Section of American Chemical Society. She was the Section E-2 (Chemical Sciences) president and a Council Member of SLAAS in 2011. Furthermore she has been conducting Pesticide awareness programs for school children of grade, 10, 11 and 12. She has received several research grant from National Science Foundation, National Research council, and Private Sector to support her research. Her main research fields include Pesticide analysis, Biosensors and Food Chemistr.y She has obtained about 30 research publications and 50 research communications to credit her research activities. Furthermore she has obtained one patent and 4 patents are filed and in the process. She has receivedYoung Scientist Award, (NSF)/TWA Sri Lanka (2001), NSF Research Award for Scientific excellence (2013), Technology Award from NSF(2015), Presidents Research awards, and NRC Merit Award. She was an International Fellow at SRI (Stanford Research Institute) International, California USA (2001-2003) while she as on sabbatical leave from university of Peradeniya. Impact of heavy metals and pesticides on CKDu in Sri Lanka. Aloe vera gel-based food products. 2017 Faculty of Science. University of Peradeniya. All Rights Reserved.